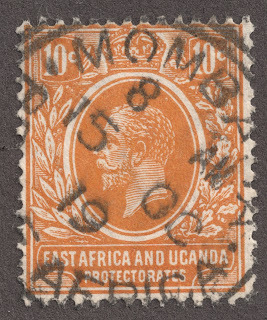 1912 1c black "George V"
"East Africa & Uganda Protectorates" was a combined postal service for the protectorate of British East Africa, and the protectorate of Uganda from 1903 to 1920. 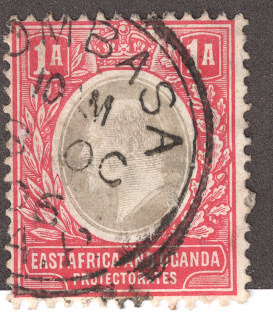 Prior, from 1890 to 1903, British East Africa had their own stamps (See separate blog). 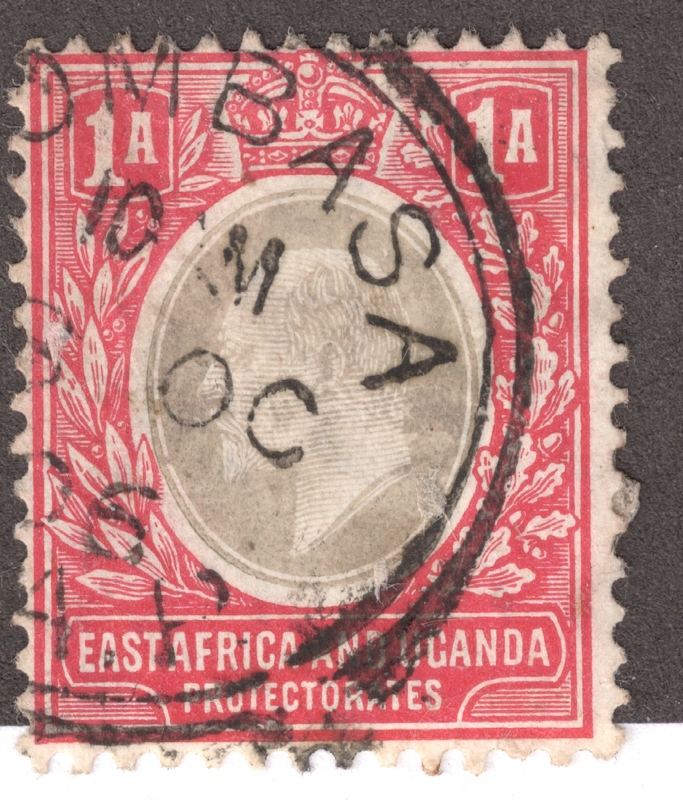 British East Africa became the Crown Colony of Kenya (except for a small coastal strip) in 1920; stamps were then inscribed "Kenya and Uganda". The British Protectorate of Uganda was developed in 1894 from the Buganda Kingdom, part of then British East Africa, and additional territory. 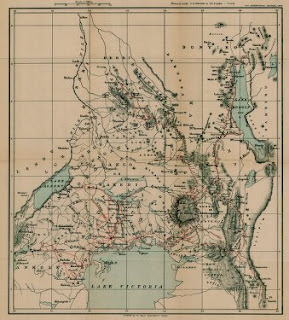 The whole area of the Protectorate of Uganda now defines present day Uganda. 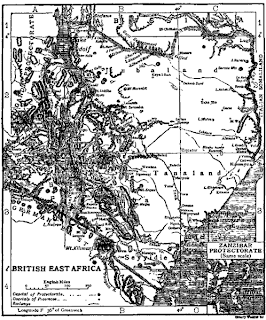 For the "East Africa & Uganda Protectorates" era , the Capital was shifted from Mombassa to Nairobi in 1905. The population was approximately 6,000,000. 1903-07 1a carmine & black "Edward VII"
Big Blue '97, on one page, has 19 stamp spaces for the 1903-1919 British colonial stamp issues of King Edward VII and George V. The 2011 Scott Classic Specialized catalogue has 71 major number stamp descriptions. Coverage by Big Blue is 27%. 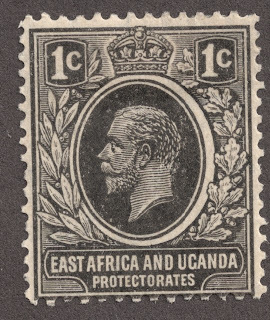 The protectorate's issues are the well known Edward VII and George V designs from 1903-1918. 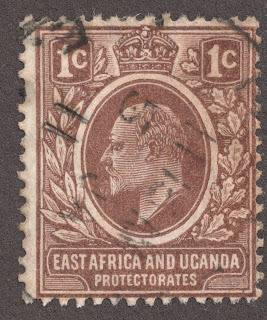 The Edward VII issues (1903-07) are a bit tricky, with watermark 2 or 3, and chalky or ordinary paper varieties to detect. Check the watermarks for this issue. Prices for the issues run from <$1-$10+, but no "Most Expensive" list stamps. Coverage by Big Blue is good, considering that additionals are generally more expensive. There are four additional King George V stamps that are only <$1-$1+. I list twelve choices for the 1903-07 Edwards, as they are part of a group that could be picked for two blank spaces. They are priced from $2+-$20+. A) The 1903-07 Edward VII 2 1/2p Scott 4($10) "ultramarine" is color specified by BB. That leaves out the Scott 20($10+) "blue", and Scott 20a($5+) "blue & ultramarine", even though less expensive. B) BB asks for George V 10c 43a ($2+) "orange", now a minor number, rather than 43(<$1) "yellow orange", even though less expensive. The '47 Scott catalogue still listed 43 as "orange", so the catalogue was changed at a later date. 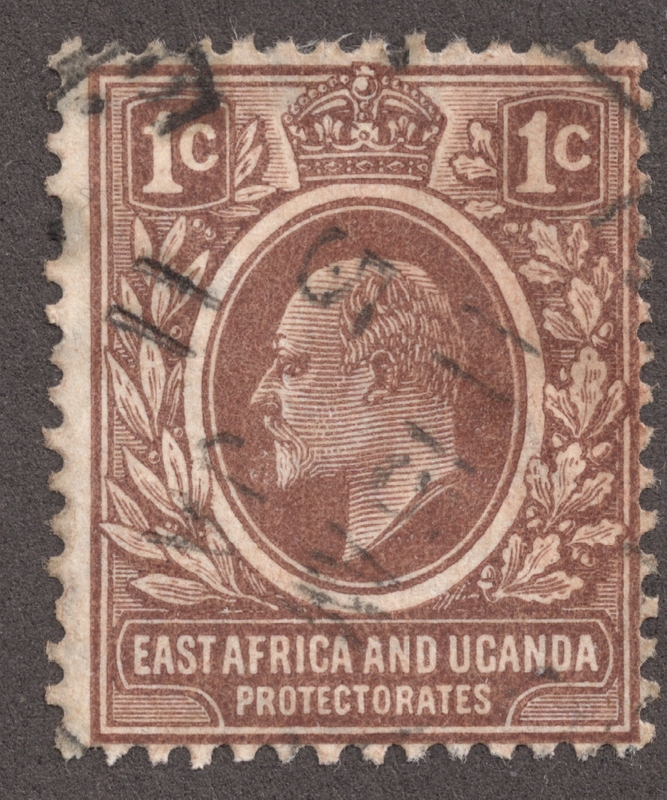 C) A cautionary word: The 1912-18 King George V "East Africa and Uganda Proctetorates" colonial watermark 3 issues clearly belong to East Africa and Uganda protectorates stamp pages. 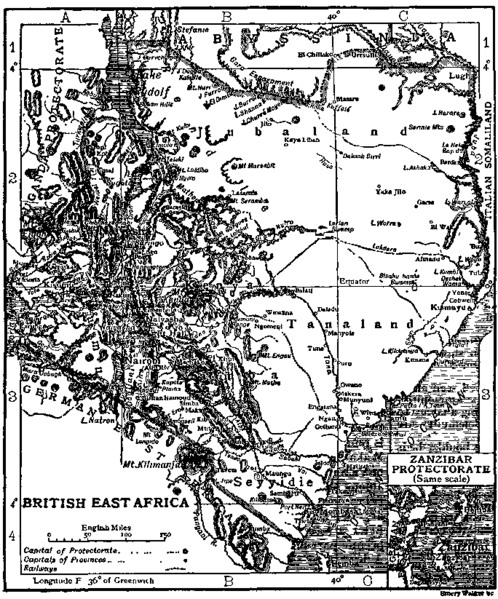 But in 1920, it became known as"Kenya and Uganda". Stamps with that inscription were produced in 1922. 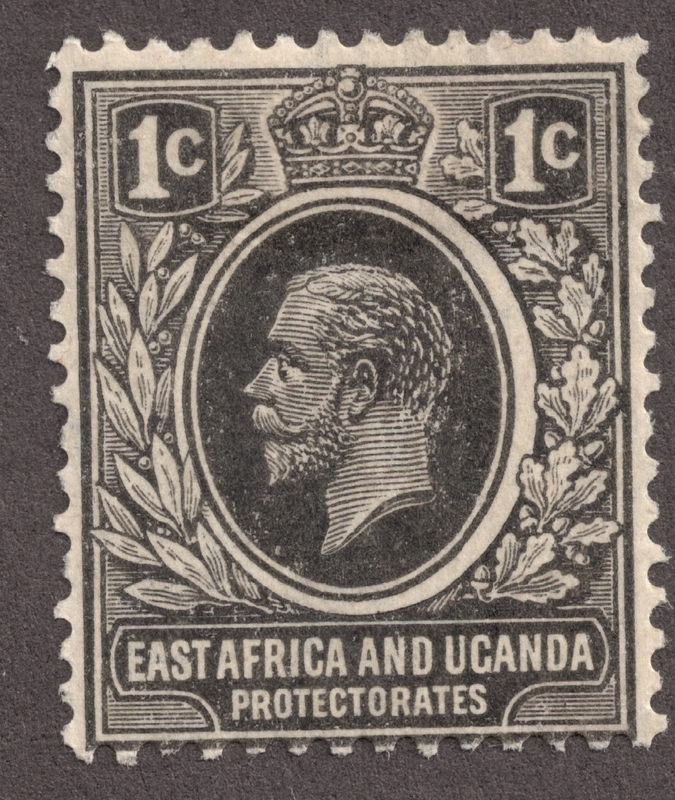 But prior in 1921, the King George V "East Africa and Uganda Protectorates" stamps were continued in use in Kenya. This issue can be distinguished by the colonial watermark 4. ! Scott has the watermark 4 issues listed under the Kenya , Uganda, & Tanzania section. 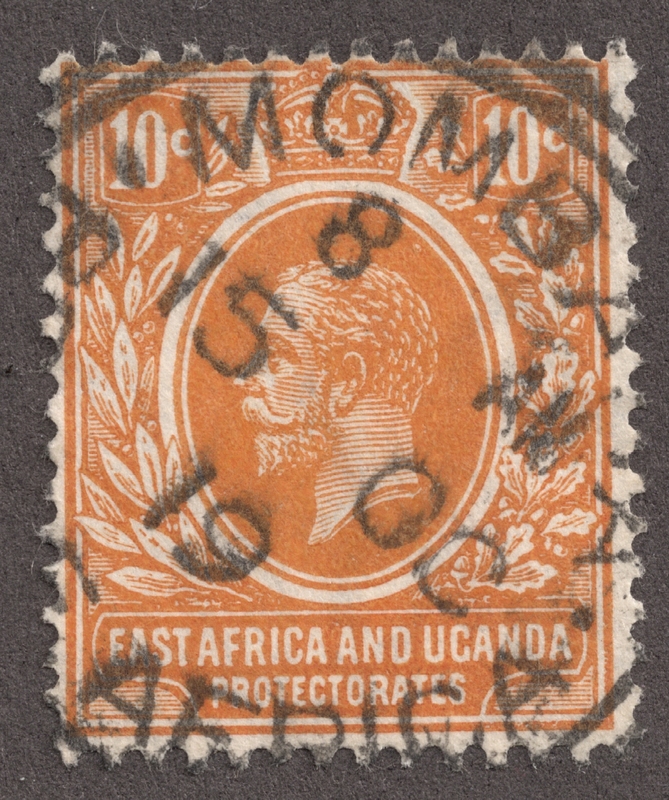 Personally, I will probably keep the watermark 4 stamps in the King George V "East Africa and Uganda Protectorates stamp pages section with a note to avoid confusion. D) And something fun; an engraving change. ;-) The 1907-08 Edward VII Scott 33 6c carmine also is found as a 33a engraving variety. Both stamps are <$1. I have an image scan on this blog to illustrate the differences. Check your collection; you might have both types! 1908 1c brown "Edward VII"
*Note 4 "ultramarine": Ruled out for color is Scott 20($10+) "blue", Scott 20a($5+) "blue & ultramarine"
*Note: compared to 33 6c carmine, 33a has a distinct white line between the lower tablet and the portrait; the word "Protectorate" is in taller letters. See image on blog. *Note 43a is 1921 10c "orange", now a minor number, but specified by BB; while 43(<$1) is "yellow orange" in the 2011 Scott. 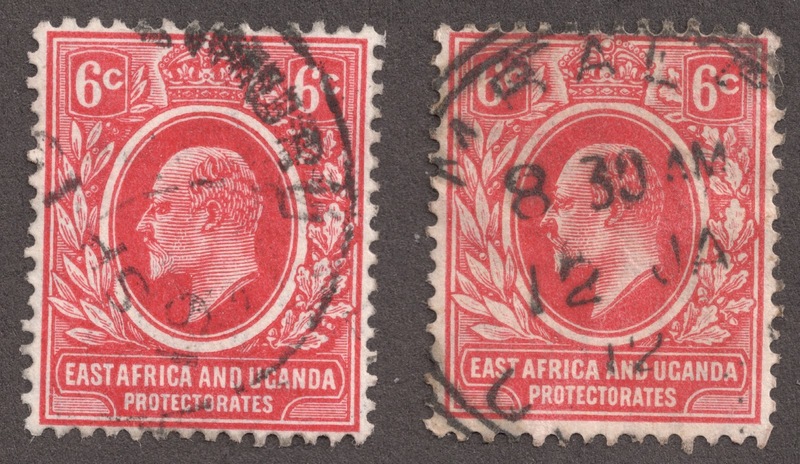 Note: The colonial wmk 4 George V stamps issued in 1920 are considered (and found in Scott) in the Kenya and Uganda section. See discussion in Big Blue Picture. 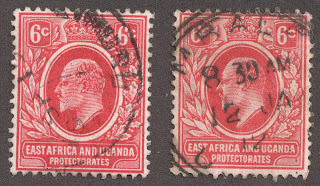 1907-08 Scott 33 & 33a 6c carmine "Edward VII"
The '97,'69,'47 and '41 editions are all identical in content. 1912-18 10c yellow orange "George V"
Classic Edward VII (The "Baldies") , and George V British colonial issues. Note: Prices are roughly binned; for actual values consult a Scott catalogue. If you enjoyed this blog, or have a thought to share, please use the Comment section below. Thanks!